Happy Sunday! Yesterday, I was lucky to guest post on Run Shop Eat Repeat (love doing that!) My topic was all about running in the winter. I don't know about you, but it's been painful enough just walking to and from my car each day, let alone going for a full-on run outside. While I've been taking a break from exercising the past few days, I plan on hitting the pavement as soon as the temperature warms up. But in order to do that and not freeze to death, I need a few of the essentials. And with a 5K just a few weeks away, this is as good of an excuse as any to hit up the mall. Pants - Cold-weather running tights are my must have when I run. They're perfect to run in on their own, but are slim enough to fit underneath a pair of looser pants. And they're right within my budget. I need these now. Sweatshirt - I love the heather gray look of this pullover fleece from The North Face. It's cute. And warm. Again, I need this. Shoes - In the dead of winter, I need a burst of color whenever I can get it, and I'm loving this neon pink. Not only are these shoes are inexpensive, super cute and will keep your summer running shoes from taking a beating from the winter salt and snow. Socks - I don't know about you, but when it's cold, my feet freeze. These athletic socks are made of wool, so they'll keep your feet warm throughout your entire run. Gloves - When going for a run in the winter, gloves are an absolute necessity. Trust me, you can't run with your hands in your pockets...I've tried. Neck Warmer - I don't currently own one, but I don't think there will ever be a better time to purchase one than when it's -10 outside. 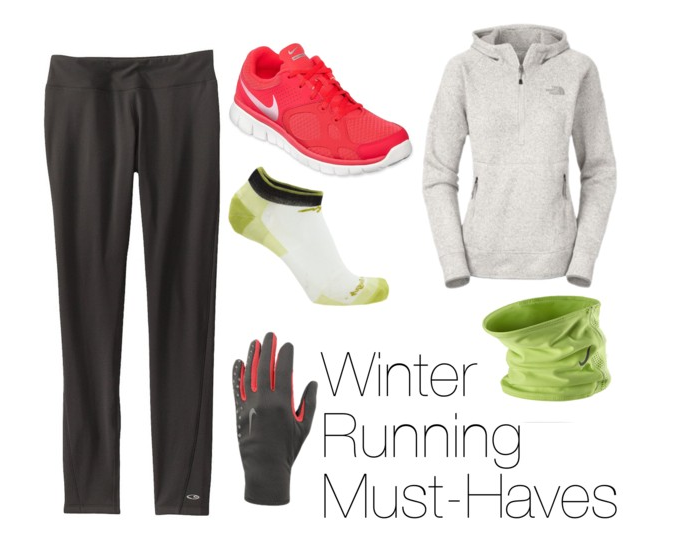 What are your winter must-haves?